Earn 1349 loyalty points when you order this item. 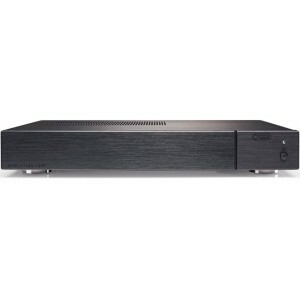 Creek 100P Power Amplifier is designed to be paired with digital or analogue pre-amplifiers like the Evolution 50CD or 100CD, with built-in volume control. If you already own an integrated amplifier like the Evolution 100A, you can use the Creek 100P bi-amp your system to power difficult loudspeaker loads. The Evolution 100P uses a massive 350 Watt toroidal mains transformer with separate windings for high and low current analogue and control circuitry. This solution produces a good power to weight ratio and low magnetic interference. Creek’s design policy of connecting several small low impedance capacitors in parallel creates an ultra-high specification capacitor to smooth the DC and helps to produce a very powerful and accurate sound from such a relatively small amplifier. This power amplifier has a similar high-end, bi-polar transistor, Class-G power amplifier circuit, to the highly rated Evolution 100A, also developed by David Gamble. It achieves very high open-loop gain and low distortion for a smooth and powerful sound. Featuring a pair of Sanken 15Amp power transistors, with built-in thermal compensation for rapid bias tracking performance. The Evolution 100P Power Amplifier circuit has very low output impedance and is also able to deliver high output current. This combination will provide exceptional speed and control over most loudspeakers. A simple unity gain pre-amplifier selects between balanced XLR and direct un-balanced RCA inputs, to enable the user to input two different signals and select between either, on the fly, if required. It is fully protected from over-current, over-temperature and DC faults and will trigger the output and input relays to disengage immediately if an error occurs. The Evolution 100P is recommended for use with Evolution 100CD USB DAC CD player along with Epos K1, K2 or K3 speakers.